29.05.2016 - 3/4 MATCH REVIEW: The FINAL4 debutants from France claim their third win against THW this season to finish third in the 2015/16 competition. 27.05.2016 - FEATURE: Can the only reigning champion in Cologne break the spell of LANXESS arena and become the first player to lift the trophy here twice in a row? 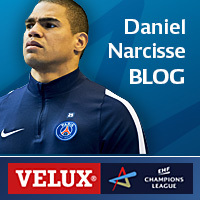 25.05.2016 - BLOG: Before Daniel "Air France" Narcisse set out to the VELUX EHF FINAL4 venue he shares his thoughts on his fourth trip with the ehfCL.com readers. 25.05.2016 - FACE-TO-FACE: There is so much the two seasoned veterans Slawomir Szmal and Thierry Omeyer have in common, but there are also things where they are so different. Only one of them will reach the VELUX EHF Champions League final on Sunday.